March 9, 2019 | By Mark Occhipinti, Ph.D.
Editor's Note: This post was originally published April 2014 and has recently been updated and revised for accuracy and comprehensiveness. To be self-employed and have your own Personal Trainer business, or work at a fitness facility? That is a question many Personal Trainers ask themselves. Once an individual has obtained the desired education and earned the intended degree and/or certification for personal training, the next step is to decide what type of employment to seek. Generally speaking, they will choose between being employed by a fitness facility or being self-employed and owning their own business. Each option has advantages as well as disadvantages that should be considered to ensure that the new trainer can make the most educated decision appropriate for situation. Being self-employed means being your own boss, obtaining clients, time and style of workout sessions. Having your own Personal Trainer business and being self-employed you earn 100% of the money and you determine your own fees. The self-employed personal trainer can see everyone as a potential client and not just club members. Being self-employed you may work alone that can mean less free time and no one to learn from, unless you share a studio with other personal trainers. Having the added benefit of a swimming pool, sauna, Jacuzzi, spa, etc.. is highly unlikely. Working as a self-employed personal trainer in client’s home you will be spending a considerable amount on traveling time, that means less training sessions (less clients, less money). 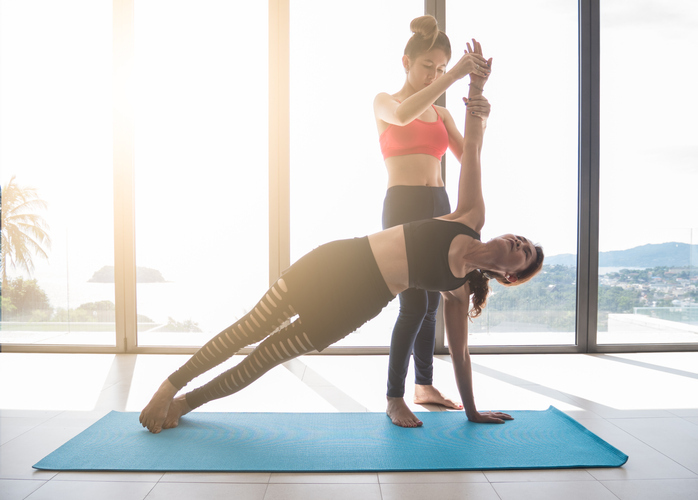 As a Self-employed personal trainer you will need to get essential fitness equipment, full liability insurance, start-up capital and business running expenditure. Working for a gym can be great for gaining experience, there are other personal trainers around that you can get an advice and learn from them. Working as a personal trainer in a fitness center you could have a wide variety of equipment. Working for a gym provided an excellent opportunity for marketing yourself to get new clients and won’t need to travel to their homes. Working for fitness center the employers may cover your liability insurance as a personal trainer and you will save money. You earn less money than you could as self-employed, means that you may need to work more. Lack of freedom in choosing your clients and time for the sessions, your supervisor can be a great boss or not. And working in a gym or club may mean less flexibility . To learn more about Personal Trainer Certifications and other Specialty Certifications click here.